We had one free weekend this summer, it has been a rough summer, maybe rough is the wrong word, but what is the right word for: "Rob had a stroke and we spent our summer getting him back on his feet and back to work while trying really hard to survive and get back to normal"? Anyway we had a free weekend right before school started, I gave it to Rob to plan away and he decided we were going to go to Yellowstone. It was going to be a quick trip, we would leave on Friday and come back on Sunday, but we were ready to pack in as much fun as we could. Did I mention we were excited?!?! We were going on vacation, like an actual stay in a hotel and not with family vacation. 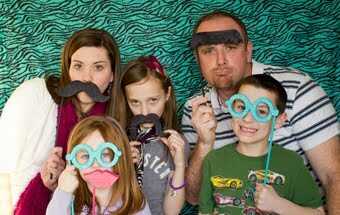 Just us. An actual vacation!!! 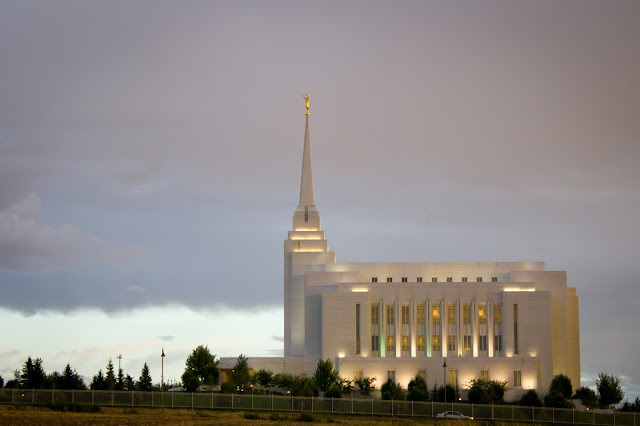 We drove Friday to Rexburg, which is were my Dad grew up and also where my grandparents are buried, so it was fun to make our first pit stop there. Not to mention the hotel was so nice, we have all become Marriott fans, and just like I predicted Saturday night's hotel was a DUMP, thankfully we were too tired to notice. Lunch in Salt Lake before we drove the long stretch to Rexburg. 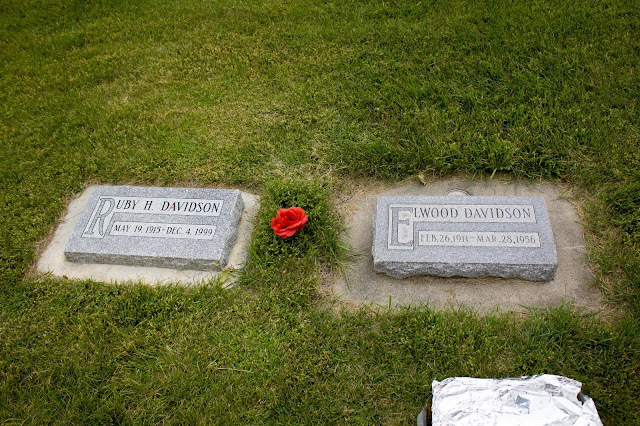 I really wanted to visit the cemetery where my Grandparents are buried. I have not been there since my Grandma was buried almost 16 years ago. Man I miss that beautiful lady!! Whenever we would visit my Grandma Ruby's house she would always have her special cake waiting, I thought it was only appropriate we took her cake with us to enjoy. Rob and I have conversations about where we want to be buried, we have moved so much, and plan to move again, that we just don't know where we would call our spot. And maybe discussing such things after he just had a stroke is not so great, but it is what we do. 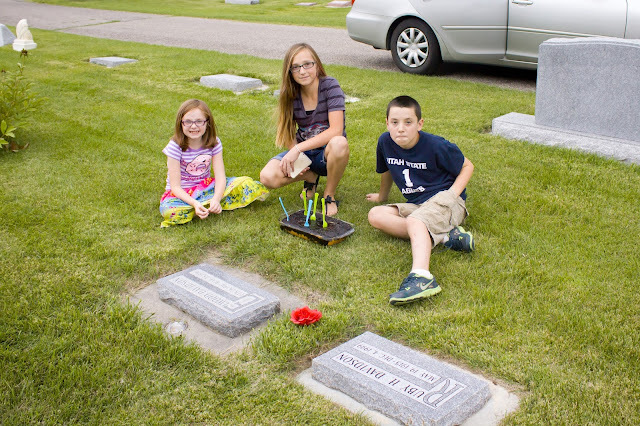 We have debated the Washington cemetery where my Grandpa Jones is buried, the Montana cemetery where his Grandpa Selman is buried, and we have now added this little cemetery to our list. It is beautiful!!! There was a crazy storm blowing in as we were leaving the cemetery, the wind was blowing and the lightening was striking all around us, like thunder shaking the car close, so we took shelter at a KFC. Cause nothing says Davidson family tradition more than a KFC. 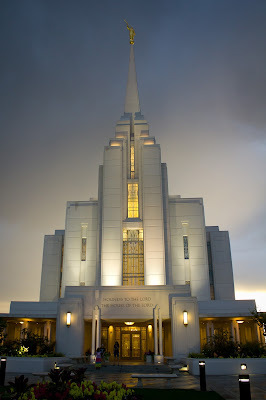 As we were driving back to the hotel to go swimming we stopped at the Rexburg temple, it is beautiful!! 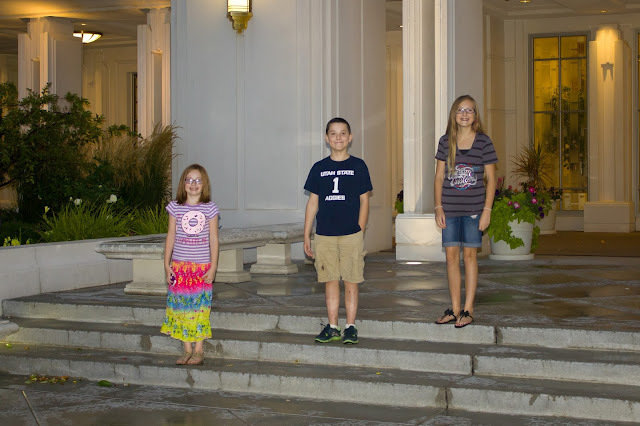 I had to get a picture of the kids, and a few of the temple. I wished that we had time to go in and do a session, one day, but for now it was great just to stop and look.